Just wanted to share a little boxing tip. Not boxing, the fighting, but boxing the organizing. I moved all of my craft and sewing supplies down to the basement. It is unfinished, but we painted the walls white to brighten it up. All the extra room to spread out is worth the lack of natural light. Well, sometimes...but there is alot of room. To store everything over the years, I have purchased the cardboard boxes from office supply stores that you assemble yourself. Some are blue, some are flowered and some have the store name on them. 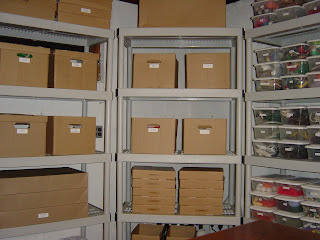 My boxing tip to make your storage or craft room look not so crazy busy, is to assemble the boxes inside out. You just have to unglue the seam on the side, fold it inside out and re-hot glue it. Seems like alot of work, but I just do it as I buy a couple of boxes at a time. Only takes a second to do and it's worth the look for this insane organizer. If I had a ton of money, you know all those boxes would be cute fabric boxes from Pottery Barn or Ikea!! Because all boxes are brown cardboard color on the inside, it makes it look a little more uniform when you have so much crap everywhere. Don't tell my husband I called it crap, because if he knew I called it crap, he would say "if it's crap why are we keeping it". Am I right ladies??? They just don't understand that we "might" need it someday. Actually, my husband totally gets me and all my stuff..poor thing. He even knows what Moda and 3 Sisters means. He's a saint...especially when I'm in a fabric store. And now for a little "MODA"vation. 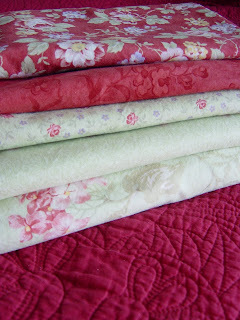 The fabrics pictured below are Sanctuary by 3 Sisters. Boy do I love 3 Sisters. These beauties have been in my stash waiting for the perfect project. Well, that project is my first GIVE-AWAY!!! So come back on Sunday for the details...well come back everyday for a visit...but definitely Sunday!! See you soon and have a great day!! Hi, just found your blog. You've made some lovely quilts. I admire your organizing skills! 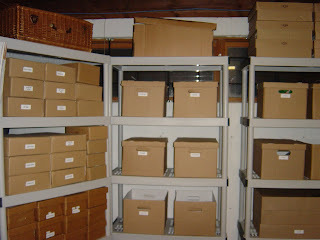 Looking at those boxes makes me want to get organizing! wow such an organized area. I am working on my sewing room right now. It is amazing how much stuff I have that I'd forgotten I had. I wish I could finish my organizing work like you! I have just a little too much things to the space, so there is no real chance to get it all done nicely. Good idea the boxes inside out!